Tues. Apr. 29, 2014….Blowout. Yes, that is what it was. I mentioned before pulling out this morning something to that effect. And I believe I also mentioned a sure bet…..sometimes one would do well to heed their own wisdom/advice. Such is myself, it was a blowout day. I knew when the last 20 minutes riding along the river and over to meet my client for today Steve Harrison that it wasn’t good. Downpour. Rained so hard just seeing at times was difficult. More red on the weather radar than red and ire of State fans after a Carolina upset. It was bad. Steve was bummed out and so was I, figuring we just might sneak in a days fishing like we did yesterday….fat chance. Zero chance. Nada. Starbucks Pumpkin Spice Latte……Caramel Macchiato………Campbells Tomato……Orange Marmalade……Sunkist Orange……Reeses Peanut Butter Pie….pick a a shade of orange or brown/orange. Every river and stream in the area was one of the above. 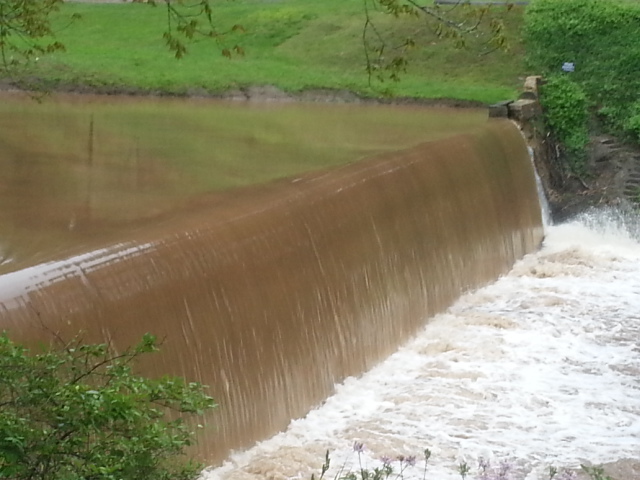 Not to mention flowing high enough to make any fishing or wading an impossibility. I was to meet Steve at 730am and we were going to try to get in some fishing before the yuck hit. The weather folks were saying later in the day, so much for that. 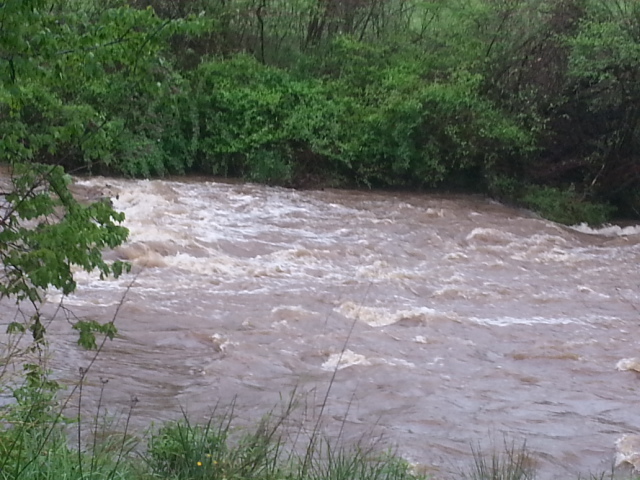 Almost 3 inches of rain fell before 7am, and the ditches were running hard. 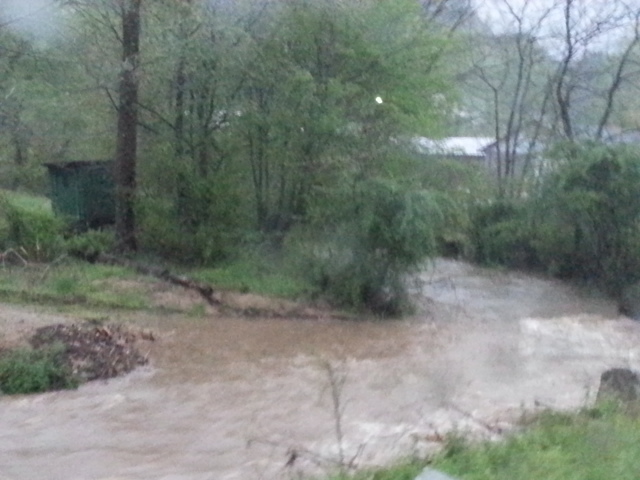 All tribs and smaller creeks were bank full and running over, a lot of flooding and flooded yards along the river. I can’t imagine what it will be like with potentially 2 to 4 more inches of rain tonight and tomorrow. Surprisingly, it didn’t rain hardly at all after 10am. But the damage was done. We bagged it, decided to call it and Steve headed home to Cary, NC. Still not convinced? It was all over. Not a single water, even the watersheds like Grandfather that can take a good soaking and still remain somewhat clear. Even Wilson/Upper Wilson, Elk and Buffalo Forks, all were muddy. Interesting though, that little of the rain made it to the Piedmont. At least nowhere near the intensity or amount as what fell in the mountains and foothills. I should have pulled the driftboat, I could have floated home. Looks like some major tying time for the next day or so, until the yuck clears up. Tomorrow looks wet, as does early Thursday. Then things clear out, and maybe by Friday something is fishable again. Very Likely. I’d bet on it. I’ll be catching up on some fly orders and also tying for upcoming trips and a busy May. Have a striper trip on Friday with my son Ben and guiding a group trip on Saturday with Tom Wren of Richmond, VA. Looking forward to getting the boots wet again. 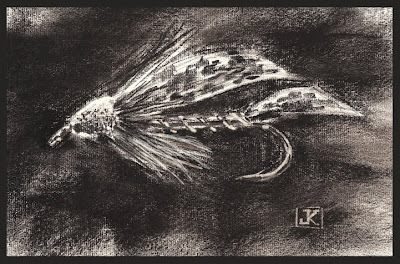 Have a great one…..sorry for the discouraging fishing report……but I must shoot it straight….right? Besides, we were getting dry and needed some rain. Several Avery, Ashe, Alleghany County waters were already looking mid summer in terms of conditions. So the rain is really a good thing. 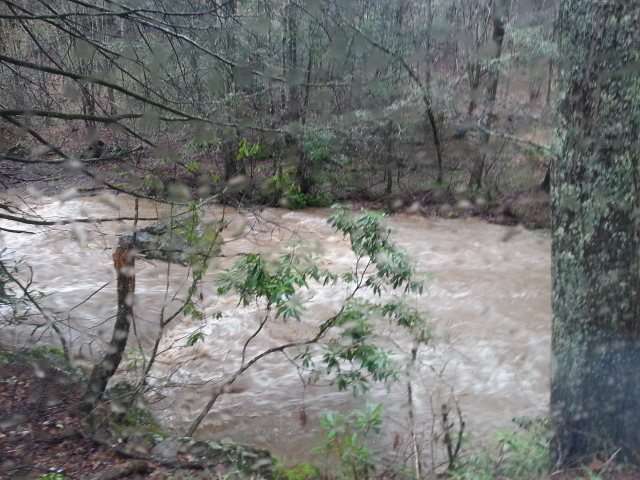 North Fork Reddies River, Wilkes Co, NC…….a raging torrent at 7am this morning. As were all other waters. Been putting in some 16 to 20 hr days, but its that time of year. 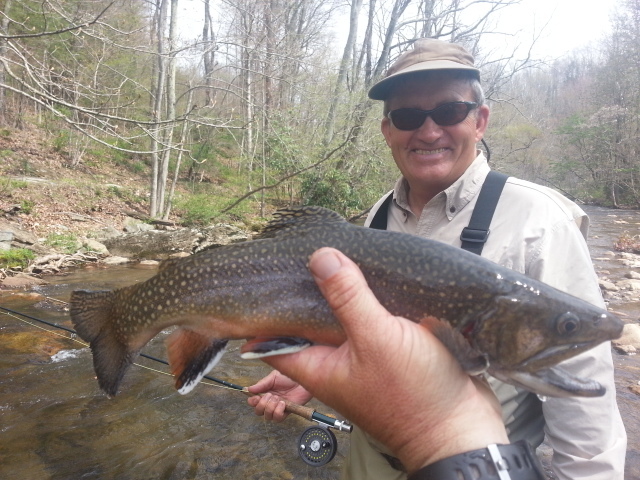 Saturday I was out, we did pretty well, guided Ray Wohlfert, Ben Saunders, Greensboro, NC , NC Mtns,beautiful weather, fishing was good early but tailed off as the day went on, 83F is mighty warm for this date, where are the upper 60s’/low 70s? Stays this warm and we’ll have summer conditions by end of next week. 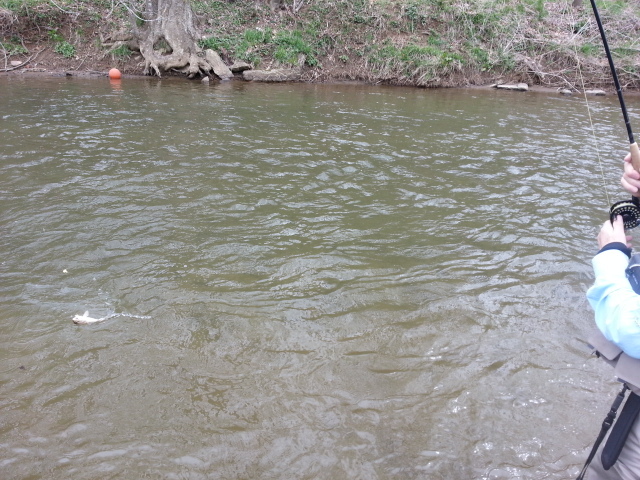 Water temp where we were fishing rose 14F today….that’s a huge jump. 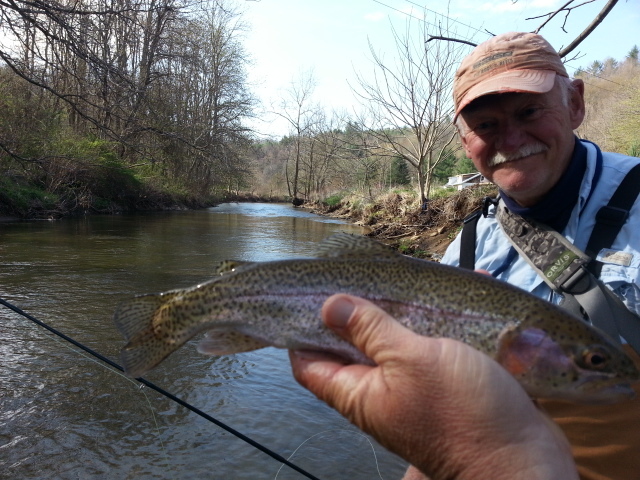 We caught a mix of brookies, rainbows, browns, Ray landed a citation rainbow…..we also had a group of about 30 canoes come through which effectively ended the fishing where we were. We went to one other location way upriver and did ok, not great, but ok.
Have a busy week on the calendar with a looming weather threat standing to deal a blow to the first half of the week. The jet stream is set to dip south giving us an unbelievable amount of moisture to work with and thus giving the mtns, foothills, and Piedmont a soaking we have not seen in some time. Monday was rainy late day with PM storms, Tuesday and Wednesday look very stormy and the potential for very heavy rain exists. Things clear out by Thursday and Friday and they look cool and dry, but the impact of heavy rains of Wed could last through Friday. 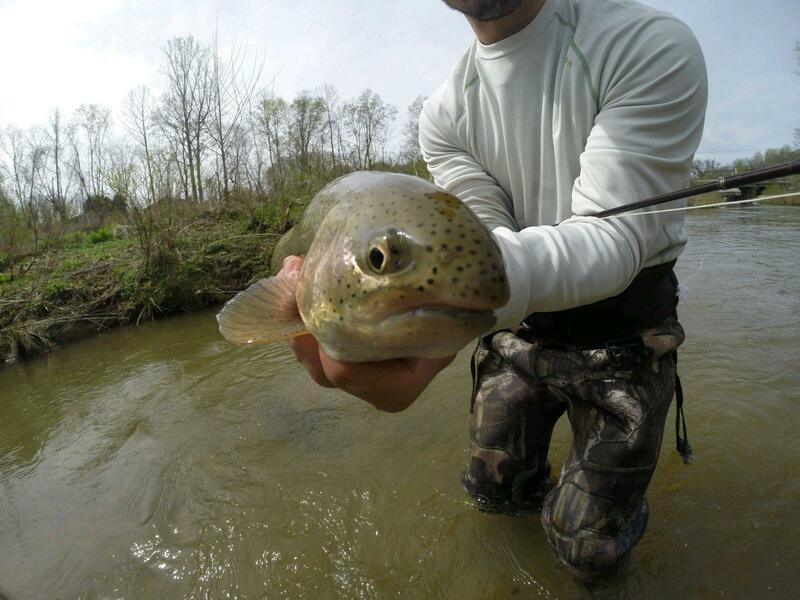 Thursday begins the final spring stockings for DH waters, with all waters being stocked again from May 1 to May 8. Did a trip yesterday (Monday) and met my client Steve Harrison early am and we were off, gray threatening skies all around us. We dodged a major bullet , I am totally shocked it wasn’t a blow out. Considering all the severe weather in East TN and SW VA we fared pretty well. We got rained on pretty good early, then a calm period from 10am til 4pm and it was partly sunny believe it or not. 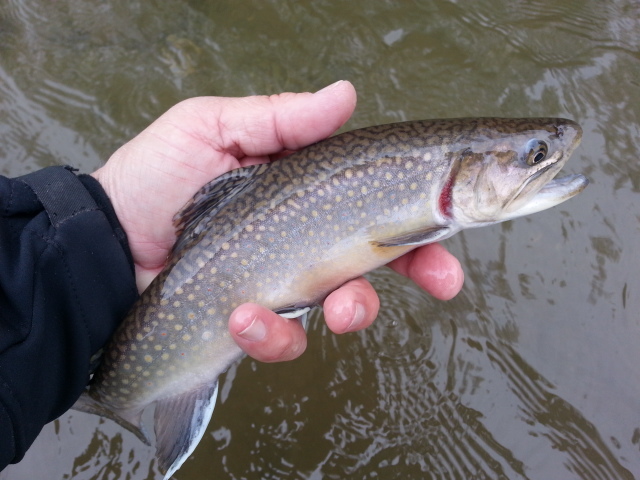 We did very well, still mostly nymphing although we fished through a hatch of Hendricksons…we caught a lot of fish on a variety of flies, a mix of browns, brookies, and rainbows, and some very nice rainbows….and one citation brook trout. We fished til late afternoon as thunder rumbled in the distance. We hit one last spot and caught a nice rainbow then the bottom fell out. We started to fish one last run and a flash of lightning caused us to rethink that. We quit on that one. It was a good day……today and tomorrow could be a doozy if the forecasted rain comes. We’ll see. I have been wrong before about the weather…..but ” *” this one looks like a sure bet. Fri. Apr. 25, 2014…… Got an early start today as I anticipated stormy weather that might end our day early. Guided Dr. Art Kriner and his son in law Dave Wiebking. It was a good day landing about 40 to 45 fish in some sometimes tough conditions. We had sun, clouds, high winds, thunderstorms, heavy rain and we were able despite it all to get in a full day. We landed all our fish on nymphs and streamers as the water was very high. 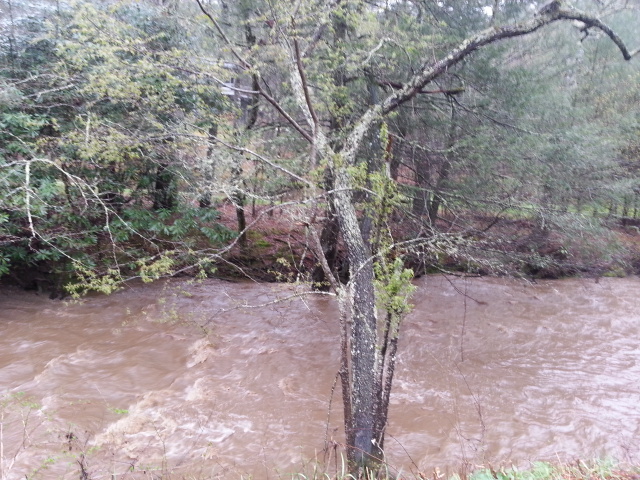 The last hour we got some really heavy rain and eventually the river started to rise more and get muddy. But still just missed a 50 fish day……so all good in that respect. Have another trip tomorrow, will be guiding Ray Wohlfert and Ben Saunders and should be a good day….hopefully the water won’t be too high n roily. Thurs. Apr. 24, 2014….Our afternoon was much like the morning….it was wide open, game on…..guided Peter Valenti and Bob Shwirzke and we ended up putting more than 75 fish in the net …what I estimated. Honestly it was a good many more than that. Bob landed a citation brook char and Peter landed a citation rainbow 22" and a brown 23". 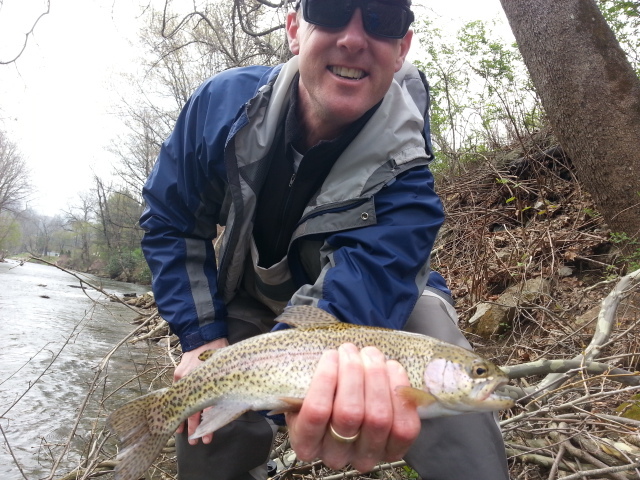 Fishing was great even with steadily shrinking stream flows. We used several tactics but with low water nymphing with midges continued to be the most effective approach. 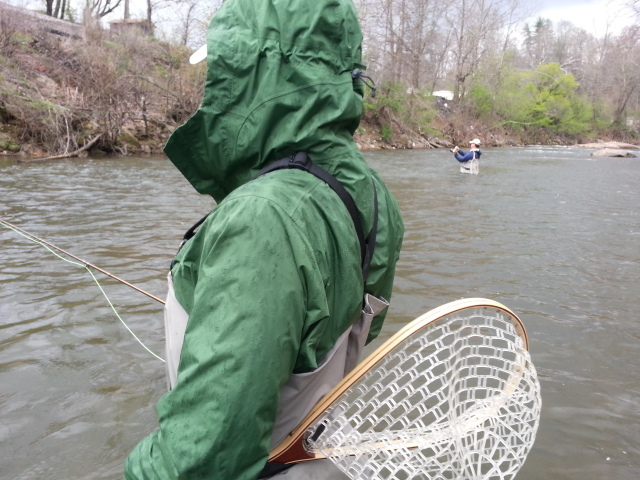 At least 60 to 70% of our fish were on midges. Long day , packing for tomorrow’s trip as I will be guiding Dave Web king and Dr Art Kriner. Looks like potentially wet weather and some thunderstorms coming for the whole day and that ought to be interesting. Have a great evening. …..
Thurs. Apr. 24, 2014…. Looks like a day of Wyoming weather….start out upper 30s and high of 70F with fair skies, light winds, and very low humidity…….glorious if you ask me. Perfect day. 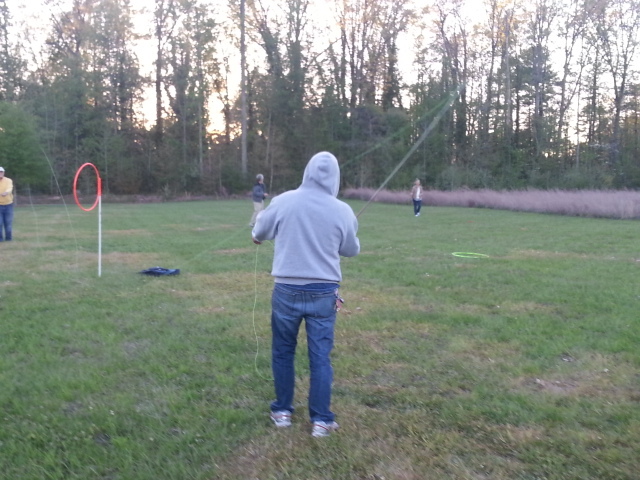 Had a great class last night with our GTCC Fly Fishing 101 class as we did casting, rigging, reading water, etc. Everyone is progressing nicely. A lot of good casters I have in this group. Plus just a great group of folks…..Nancy Lee, Ray Wohlfert, John Pfister, Ben Saunders, and Keith Siler. Truly awesome folks and it’s a privilege to have them. 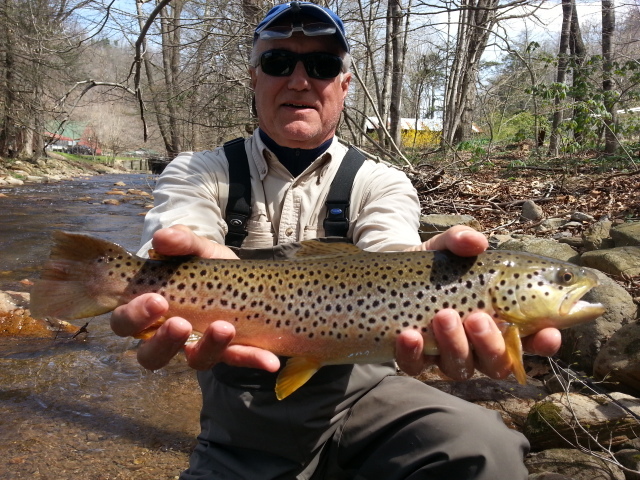 Guiding a trip today on two waters, guiding Peter Valenti of Pinehurst, NC and Bob Shwirzke of Fayetteville, NC. We should do fine and maybe even score some on top. Looking to a good day……and you’ll hear all about it…..
More to come, enjoy your Thursday..tomorrow stormy weather returns…. Thurs Apr. 24, 2014……Guiding Peter Valenti and Bob Shwirzke today and it’s been a bang up morning so far. Landed 25 fish mostly nymphing with midge patterns, a tactic that is the right medicine for falling water levels. Headed to another spot……..time to put the hammer down on some more…..
Tues. Apr. 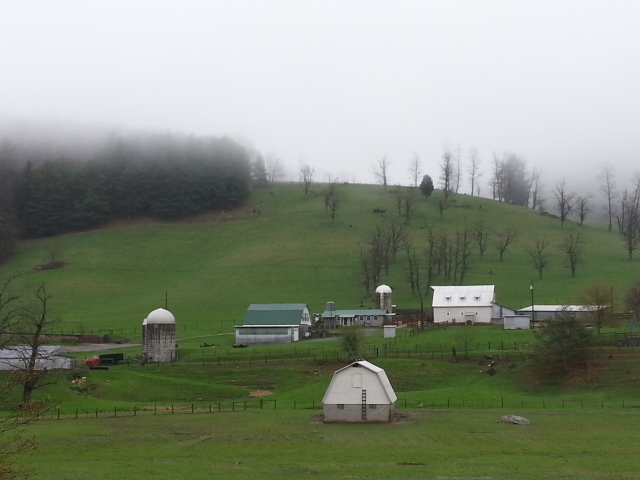 22, 2014…..Good day in Mitchell and Avery Counties today guiding Dr Sims Riggan and his son Cole. We had some weather to deal with today, had a front moving in so we changed where we had planned to fish and it proved to be a good move. We landed about 35 fish a mix of rainbows and browns and several fish up to 16". Very little dry fly activity, the water still cool where we were. It was a little high as well, so we ended up deep nymphing with very heavy rods and rigs. Worked well, including one spot where Cole masterfully waded and followed my pointers as we fished a very tight and deep run where a tree had fallen in. With very little room for casting error Cole managed 14 fish landed from that spot, and several others hooked that shook free before getting to net. It was mild n muggy to start but just after lunch rain set in and we had a half hour to 45 minutes of hard rain. It was beginning to run the ditches hard and frankly I am shocked the river didn’t rise and get dirty as it was already a bit high. Great two days with Sims and Cole…..they were fantastic. I think we landed over 100 fish in two days fishing. The guys did a great job. Good week so far, a few 20 hr days and a couple more to come. Time for some sleep! Tues. Apr. 21, 2014….Great day yesterday both in terms of fishing and weather, it was 71F sunny and no humidity with a light breeze. A glorious day, just a perfect day to be outside. I guided Dr Sims Riggan and his son Cole and we had a good day landing between 40 and 50 fish. Surprisingly few fish rising, we caught all our fish on nymphs and strymphs…..for that it was game on. Headed out to guide Sims and Cole again today and we will be fishing shortly. 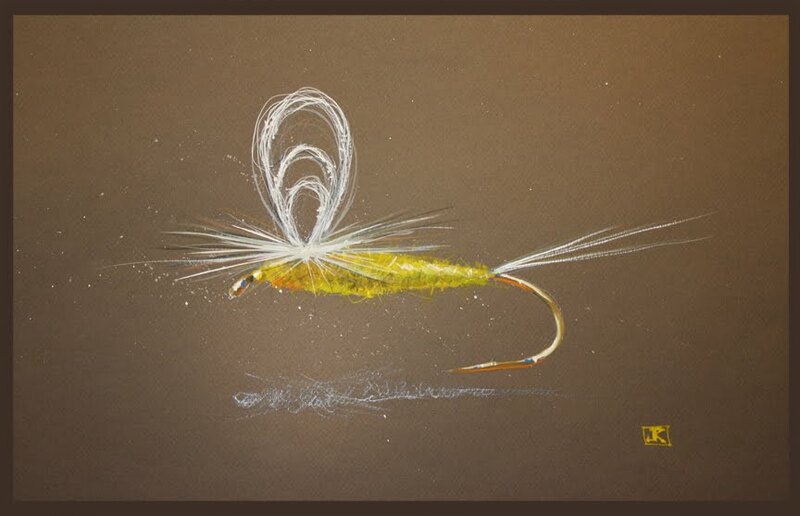 Look forward to another great day….fishing is wide open….or normal……for Spring. Sat. Apr. 19, 2014….. Early to rise this morning, getting ready to head out for breakfast then on to guiding Dr Ken, Karb, Dr. Hy Muss, and Ted Birke. It’s cloudy, cool, and rain today, and won’t make it out of the 40s …..it’s almost May…..right? We had a great day yesterday landing over 50 fish and got into a blue winged olive hatch at the end of the day and nailed the last dozen fish or so on dries. It was great. Could be looking at more of the same for today. Fri. Apr. 18, 2014……Great morning of fishing so far we have landed about 40 fish so far and it’s only 1pm. Guiding Dr Ken Karb, Dr Hy Muss, Ted Birke…..had a good morning but all nymphing. Only two rises all day, water is cold after several really chilly nights. Headed off to do some more fishing…..